Williams and fiance Dennis McKinley are overjoyed with daughter Pilar Jhena or 'PJ' for short. 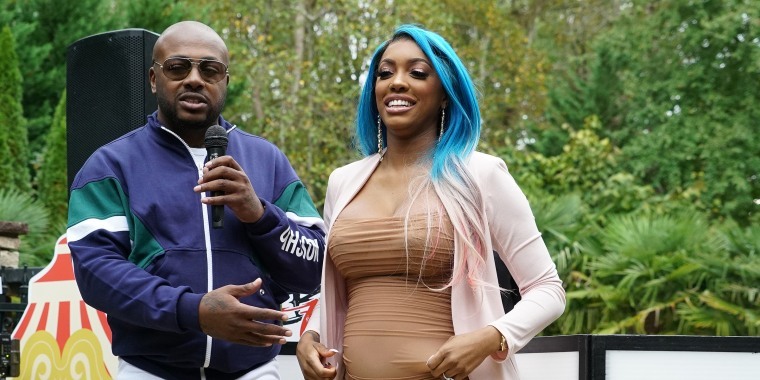 Porsha Williams, a "Real Housewives of Atlanta" star since the show's fifth season, just got a whole new role in life. The 37-year-old model and actress welcomed her first child into the world on Friday, March 22. Williams and her fiance, Dennis McKinley, celebrated their daughter’s arrival at 1:36 p.m., after McKinley suggested her forthcoming birth on Instagram. “It’s going down!” McKinley, an Atlanta-based entrepreneur, wrote in his caption. The post captures Williams and McKinley perched on a hospital bed, with the mom-to-be looking beautiful and relaxed. McKinley, also a first-time parent, included the hashtag “#BabyPJ” in his post, hinting at the one-day-old baby’s name, Pilar Jhena. Williams, 37, has dreamed of becoming a mom for many years. Last September, the "Dish Nation" host opened up about suffering a miscarriage at the age of 31. Six years later, when Williams became pregnant with Pilar Jhena, the expectant mom felt grateful for a second chance at motherhood, but worried about carrying her precious baby to term. “When I found out I was pregnant, I was excited [but] I had mixed feelings. The other feeling that I had beside excitement was fear,” the reality star told People. Now, with a healthy baby girl by her side, Williams feels blessed for this sweet new chapter. McKinley, like Williams, was over the moon to find out he’d be a dad. Williams kept the baby news a secret until McKinley’s 42nd birthday, last July, as a happy birthday surprise. In September, the happy pair went public with a baby announcement and soon after, the sweethearts confirmed their engagement. Since then, the parents-to-be have celebrated every tiny milestone in Williams’ pregnancy. In October, the real housewife revealed her baby’s gender on Instagram with a jubilant video and confetti-filled photos. “It's a GIRL!! - my heart is SO full!” Williams wrote in another post, memorializing the celebration. And earlier this month, Williams and McKinley celebrated their baby girl with a winter wonderland-themed baby shower. Williams' family, friends and "Real Housewives" costars, including Kenya Moore and Cynthia Bailey joined the party. "Oh you already know it was a turn up!" Williams wrote of the blowout. "Ain’t no party like a McKinley party," she wrote on Instagram. Williams’ next season, both on "Real Housewives of Atlanta" and off-screen, will certainly be filled with new adventures.